Malcolm Coles spotted an interesting change in Google's ranking algorithms. If your query includes the name of a company, an organization or any name associated with a website, many of the top search results are pages from that site. 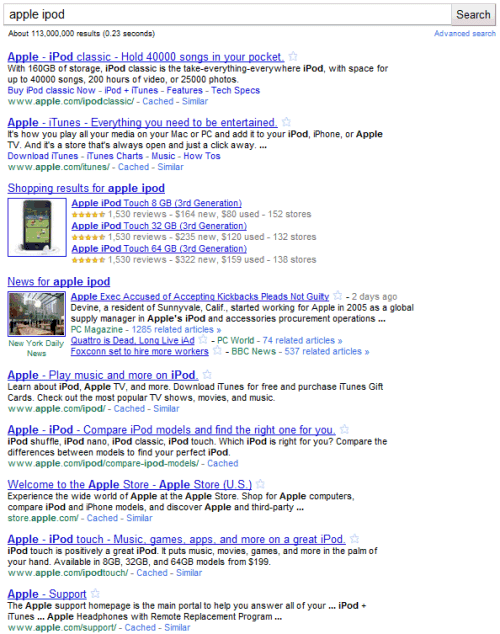 For example, a search for [apple ipod] returns 7 pages from apple.com on the first page of results. Google confirmed this change: "We periodically reassess our ranking and UI choices, and today we made a change to allow a larger number of pages from the same site to appear for a given query. This happens for searches that indicate a strong user interest in a particular domain." Bill Slawski found a Google patent about detecting entities from queries and performing implicit site searches. "A system receives a search query, determines whether the received search query includes an entity name, and determines whether the entity name is associated with a common word or phrase. (...) When the entity name is not associated with a common word or phrase, the system rewrites the received search query to include a restrict identifier associated with the entity name, generates a link to the received search query, performs a search based on the rewritten search query to obtain second search results, and provides the second search results and the link to the received search query." When you search for [apple ipod], Google detects the entity [apple], finds that it's associated with www.apple.com and adds some results for the query [ipod site:apple.com]. Search engines limit the number of search results from a domain to 2 or 3 pages that are usually grouped. The goal is to show diverse results and to prevent websites from dominating the first page of results. Showing too many results from Apple's official site when searching for [apple ipod] is not a good thing because some people might want to read reviews, historical information from Wikipedia, news articles. "I agree that diversity of sources is a desirable goal, and in fact the results naturally tend to be diverse. We do some simple things to increase the diversity. If you check almost any topic, you will get diverging viewpoints. Everyone on any side of an issue will typically complain, though. Environmentalists will say,'Why aren't you showing our results first?' An industrial group will say, 'Why aren't you showing our results first?' They all want to be number one. We think it's good for us to encourage diverse viewpoints, and the search engine presents them. It happens naturally as a response to queries." 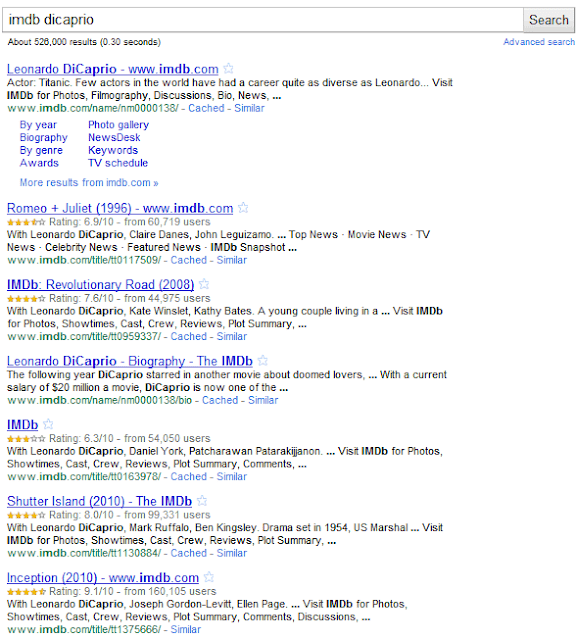 The change is useful for queries like [dicaprio imdb], [michael nyman wikipedia], where imdb and wikipedia are shortcuts for site:imdb.com and site:wikipedia.org. Well... this is good and bad.... on one side its good for big guys as they will come up more often in search results, however this could completely kill the smaller guys selling the big guys products. This should be reviewed by SEO Community and there should always be a way around it, however what it is well have to find out.